Honey Lime Mahi Mahi is a quick, gluten-free dinner you can grill in under 10 minutes. Lay the thawed Mahi Mahi fillets onto a lined baking sheet. Combine the chili powder, salt, pepper, and cardamom – mix to combine. 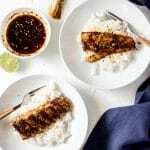 Generously coat both sides of the Mahi Mahi fillets with the spice rub mixture. In a small bowl, combine the liquid aminos, raw honey, lime juice, and red pepper flakes – whisk to combine. Preheat the grill over medium heat. Add the Mahi Mahi fillets and cook for four minutes on one side, then flip and cook for another four minutes. When the Mahi Mahi fillets are nearing done – brush the glaze onto each fillet with a basting brush. Once the fillets flake nicely and reach an internal temperature of 137 degrees F. – remove from oven and place onto a clean baking sheet. Serve with your favorite vegetable side, or over a bed of rice. Add additional glaze if desired. If your Mahi Mahi fillets have skin on them, remove before cooking. Some frozen fillets will come with skin on one side. Be sure to fully thaw your Mahi Mahi before cooking.